Well, friends, the forecasts were correct and summer is here with a vengeance. The Northlands are warm, the Midwest is hot, and Phoenix spontaneously burst into flame. You know what this means. It is time to climb aboard your snorting four-stroke steed and hit the road. You endured the winter looking forward to this time of year. Now it is time to make those wintertime dreams come true. However, with the hot weather comes issues and concerns that spring and fall rides don’t entail. The summer months mean you must protect yourself and your machine. Gildshire has some hints and tips before you head out on the highway, lookin’ for adventure, or whatever comes your way. 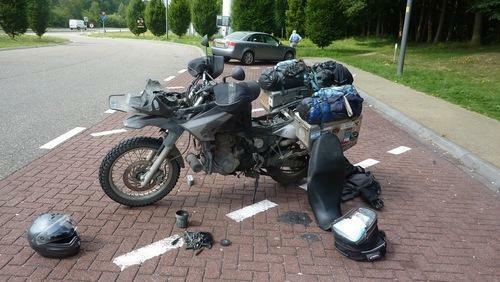 You may love the warm sun in your face but heat will do strange and destructive things to that bike. Before exposing it to a 90-degree day, do the following small things to avoid a big problem. Check your fluids. That means oil, clutch, brakes, and coolant. Dirty coolant operates at less than half the efficiency of clean coolant, and running with less than a full load of oil is asking for trouble in the form of a seized engine. Examine your hoses and wires for cracks, or soft spots. They are the beginning of a long walk home on a hot, summer day. Even hairline cracks can become a gaping maw on a long ride during a hot day. Avoid excessive engine idling. You’ll idle occasionally as a matter of course, but switch off on a hot asphalt parking lot or at the bank drive-through queue. Also, you’re not doing yourself any favors by repeatedly revving your engine while idling. How are your tires holding up? Don’t just check for tread depth. Notice uneven wear, because those spots are particularly vulnerable to failure in hot weather. If your tires are wearing unevenly, the fault may lie in the alignment. Or, you may have cut corners when you bought your last pair of tires. You have heard about dressing for success. Well, the same concept applies for summer biking. You’ll want to don attire that won’t make you melt by mid-day. Is it time for a new helmet? Consider a light colored one. The difference in sunray absorption is unbelievable! Exchange those heavy old-school leathers for lighter-weight textiles. Mesh jackets (the Rev’it Traction jacket, for example) provide superior protection in a breathable package. Staying cool on a summer ride is about two things. First, it’s about the circulation of air around your body. Try dipping a bandana in cool water and wearing it around your neck. Better yet, buy a shirt that can be soaked in water. It will evaporate in the breeze during the ride. A less-expensive option ($10 at Target) is to buy clothing that wicks away the moisture. Any, or all, of these ideas, will cool your core, which is the main idea. This last one shouldn’t need to be said, but every summer the Emergency Room is populated with people who didn’t pay heed. So, here we go. Drink water! Soft drinks or iced tea may taste better, but your body wants plain water, and if you wait until you feel thirsty you have waited too long. Invest in a hydra-pack and sip while you ride to keep your head clear. Summer rides mean more pit stops for rest and snacks. Park in the shade, so your stand won’t sink into the soft pavement and the bike’s components can catch a break from the hot sun. Break time is also the time to douse any inadvertently exposed skin with moisturizer and sunscreen. You’ll know the spots because they are already starting to turn red and sting. If you don’t need to use the restroom after an hour or more on the road, drink more water. Sometimes, a lack of bladder urgency is a sign that dehydration has set in. Do you have all that? Good, because the open road is calling your name. Ride like the wind!